Black Castings™ are the most potent worm castings available. Find out how our castings are "Super-Charged", giving you the most effective source of organic fertilizer for your garden, lawn and plants. With pure Black Castings, VermaPlex®, VermaMax®, you are receiving consistent quality year in and year out. Certified organic and OMRI listed, pure Black Castings™ are 99.9% ALL castings, containing no filler or excess moisture. You're getting nothing but enhanced worm castings. 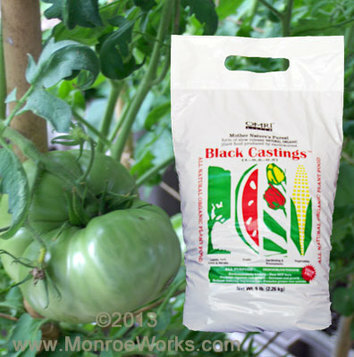 Black Castings™ was tested extensively by soil chemists. These scientists found the highest quantity of the most valuable beneficial microbes and micro-nutrients contained in any vermi-cast soil amendment on the market today. Because of their exceptional quality , we are not only a proud authorized distributor of these find organic soil amendments, we are also a satisfied user.